In the early 1990’s The U.S. Congress directed funds to the National Institutes of Health (NIH) to address the rapid increase in asthma morbidity among children. The increase in asthma, of more than 150% over the prior decade, was especially high among urban minority children. A network of asthma investigators was convened by the National Institute of Allergy and Infectious Diseases (NIAID) to address this problem. 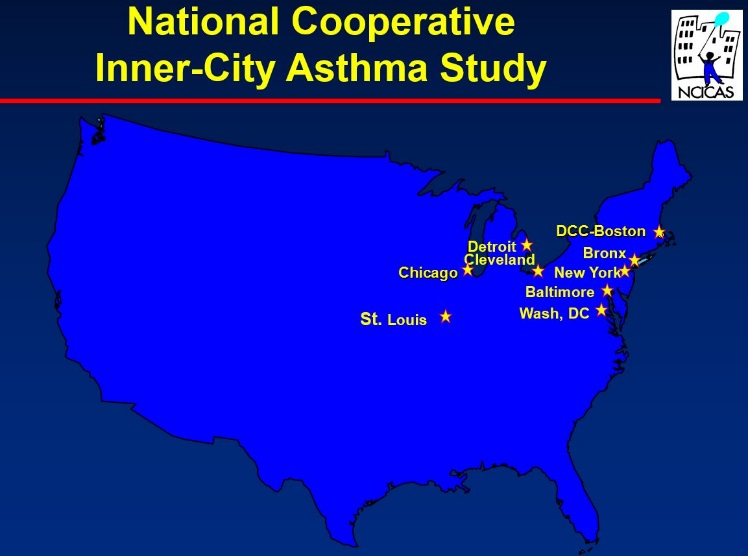 The investigators, from eight major U.S. urban cities, began by conducting a large scale epidemiologic study of more 1,500 children to understand more clearly those factors associated with asthma morbidity in the urban minority populations , , . Although asthma was thought to be a complicated disease, this study, the National Cooperative Inner-City Asthma Study (NCICAS) revealed that asthma is a highly multi-causal, complex disease with a large number of risk factors that varied dramatically among the children in this year long observational study. problems in the family; healthcare and asthma attitudes; and, allergen sensitivities [4-11]. Although these many risks were anticipated to some degree, the variety and unique combinations of these risks among the children was surprising. - Mitchell, H., Senturia, Y., Gergen, P., Baker, D., Joseph, C., McNiff, K., Wedner, J., Smartt, E., Crain, E., Eggleston, P., Evans, R., Kercsmar, C., Kattan, M., Leickly, F., Malveaux, F. Design and Methods of the National Cooperative Inner-City Asthma Study, Journal of Pediatric Pulmonology, 1997; 24:237-252. - Kattan, M., Mitchell, H., Eggleston, P., Gergen, P., Crain, E., Kercsmar, C., Redline, S., Weiss, K., Evans, R., Leickly, F., Malveaux, F., Wedner, J. Baseline Characteristics of Children with Asthma : The National Cooperative Inner-City Asthma Study, Journal of Pediatric Pulmonology, 1997; 24:253-262. - Wade, S., Weil, C., Holden, G., Mitchell, H., Evans, R., Kruszon-Moran, D., Bauman, L., Crain, E., Eggleston, P., Kattan, M., Kercsmar, C., Leickly, F., Malveaux, F., Wedner, J. Psychosocial Characteristics of Children with Asthma: A Description of the NCICAS Psychosocial Protocol, Journal of Pediatric Pulmonology, 1997; 24:263-276. - Rosenstreich D, Eggleston P, Kattan M, Baker D, Slavin RG, Gergen P, Mitchell H, McNiff-Mortimer K, Lynn H, Ownby D, Malveaux F. The Role of Cockroach Allergy and Exposure to Cockroach Allergen in Causing Morbidity Among Inner-City Children with Asthma. New England Journal of Medicine, 1997; 336 (19): 1356-1363. - Crain, E., Kercsmar, C., Weiss, K., Mitchell, H., and Lynn, H. Reported difficulties in access to quality care for children with asthma in the inner city. Archives of Pediatric and Adolescent Medicine, 1998, 152:333-339. - Wissow, L.S., Roter, D., Bauman, L., Crain, E., Kercsmar, C., Weiss, K., Mitchell, H., and Mohr, B. Patient-provider communication during the emergency department care of children with asthma. Medical Care, 1998, 36 (10): 1439-1450. - Eggleston P, Rosenstreich D, Lynn H, Baker D, McNiff-Mortimer K, Kattan M, Gergen P, Mitchell H, Ownby D, Slavin RG, Malveaux F. Relationship of indoor allergen exposure to skin test sensitivity in inner-city children with asthma. Journal of Allergy and Clinical Immunology, 1998, 102:563-570. - Crain, E., Mortimer, KM., Bauman, L., Kercsmar, C., Weiss, K., Wissow, L., Mitchell, H., and Roter, D. Pediatric asthma care in the emergency department: Measuring the quality of history taking and discharge planning. Journal of Asthma, 1999, 36 (1): 129-138. - Gergen P, Mortimer KM, Eggleston PA, Rosenstreich D, Mitchell H, Owenby D, Kattan M, Baker D, Wright, E., Slavin R, Malveaux F. Results of the National Cooperative Inner-City Asthma Study (NCICAS) environmental intervention to reduce cockroach allergen exposure in inner-city homes. Journal of Allergy and Clinical Immunology, 1999, 103: 501-506. - Wade, S., Islam, S., Holden, G., Kruszon-Moran, D., Mitchell, H. Division of Responsibility for Asthma Management Tasks between Parents and Children in the Inner-City. Journal of Development and Behavioral Pediatrics 1999, 20 (2): 93-98. - Weil, C., Wade, S., Bauman, L., Lynn, H., Mitchell, H., Lavigne, J. The Relationship between Psychosocial Factors and Asthma Morbidity in Inner-City Children with Asthma. Pediatrics, 1999, 104 (6):1274-1280.